So today almost ended up being a two-a-days day, but because I am a smart, level-headed individual, I talked myself out of it. So who’s Newton guy? 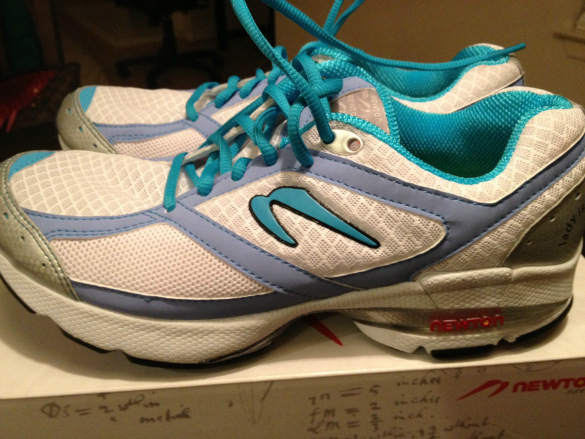 Doh, he works at Newton Running — a company that makes, as far as I understand, shoes that enhance proper running form. As in, forefoot strike (good) — heel strike (bad). For a much more credible primer on natural running, you may want to check out Natural Running: The Simple Path to Stronger, Healthier Running : a book by Danny Abshire, the founder of Newton Running. I know what’s next on my reading list! Newton Running held a running clinic at my local Road Runner Sports store this evening, and guess who was the first person to show up. Actually, guess who was the only person to show up! Talk about VIP treatment! I’ve been eyeing them Newtons for quite a while now, but mostly for the wrong reason: these things come in awesomely bright colors! Seriously, look at them. So fab. I even tried a pair at the SJRnR expo, but they felt too tight and weird. Also, crowded, seeing how there were at least 17 other people trying shoes within a three-foot radius. The crowds were no issue at all this time and Newton Guy and I went for a leisurely run outside: he wore one pink shoe, one green, I wore these, wishing they were pink or bright green. But color envy aside, I was surprised at how comfortable they felt! The soles are way firmer than anything I’ve ever run in and that actually felt great. Newton guy said this actually improves running efficiency – instead of bouncing up and down with each step (however minimally), the foot just lands on a firmer surface. If that makes sense at all. I’m telling it like I remember it, so I may be saying all the wrong things. I wish I could take notes while running. Right at the ball of the foot, the sole has a tangibly (even) firmer part, which actually helps landing on your forefoot or midfoot, rather than on your heel. Of course, I land heel first. But, at least, Newton guy said I don’t transfer my weight on the heel itself, but rather on the rest of the foot as it lands. Yay! Newton guy actually made a video of me running outside and promised to email it to me. I can’t wait to make some ridiculous animated gifs and share them with all my social networking friends. The Internet truly needs more animated gifs, especially of me running. I am most bummed out by the fact that they only came in white/ blue. I mean, at least, they could have reversed to blue mesh, white lining. Oh well. Life’s unfair that way, or, as some of my friends would point out: first world problems. And yes, I totally considered going for one of the more awesome colors – like these – but Newton guy said those are just not the right type of my foot and, well: I do, too, say that one should never pick their running shoes based on color. Newton guys, I give you four to six months to make these in bright orange or yellow, blue and purple (all of those colors combined, if possible), because I want my next pair to be visible from space. On the bright side, you know how much I paid for them? Nope, not $149 before tax. Because I have VIP membership at Road Runner Sports, I get 10% off on everything sold in the store. (And VIP membership costs only $1.99 a year so really, it’s a no-brainer.) Then, because today was a special event, I got another 10%, so there you go: $120.65. 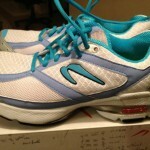 That is still about $40 more than I normally pay for a pair of running shoes, but I do have high hopes for these Newtons! Because they are meant to enhance proper running form and do feel different, one must ease into them rather than doing a half-marathon straight away. So rather than running in them this Saturday, I’ll take them for an easy 2-3 miler tomorrow, then next week I’ll go up to three miles at a time, after that – 4-5, and come November 12, I switch over full time and commence marathon training. FTW! 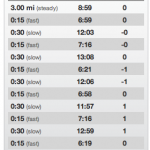 Ran with HusbandRuns who, despite having officially announced his retirement from the sport after finishing the NYC Marathon in 2007, is still faster than me. More first world problems. I mean, the man once ran a 1:40 half marathon. No intervals, no hills, no nothing. 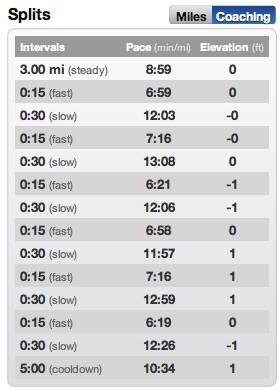 And so, as you can see below, the three “easy” miles were run at an average 8:59 pace (for me, easy is 9:24, no less). Then six strides (run like you’re chased by zombies for 15 seconds, rest for 30). ← Race News. Marathon. New Shoes?